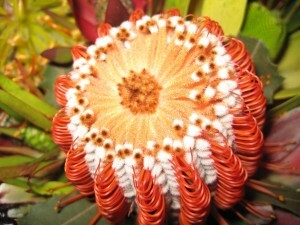 Back on Maui, this upcountry Protea comes to wish us all a most harmonious New Moon in Aquarius and Year of the Dragon. Breathe deeply, gaze at the complex layering of sacred geometry of this protea flower, and let him instruct you for your own multi-dimensional lines and loops of flow. Ask the powerful energy of Dragon if he has a message for your new year. – I only have internet available every few days on this trip, so if you are emailing me in the next couple weeks, I may be somewhat delayed in my response, but will be back to you soon. Happy Chinese New Year! I just wondered…. have you ever taken one of your beautiful photos of a white gerbera? I am wanting to paint one and my instincts told me to ask you….